The opening credits tell you everything you need to know about Juan Antonio Bayona’s fantastic family parable: calligraphic writing is etched onto parchment, water colours are applied and gently blown from the page, and cogs whir in silent synchronicity. So much love, craft, and affection have gone into this story of impending grief, and it’s up there on the screen with every emotional beat or moment of triumph lifted from Patrick Ness’ book. Conor (Lewis MacDougall) is an insular soul, partly through inherent shyness, but also because his mother (Felicity Jones) has been diagnosed with cancer. When she becomes too ill to live at home, Conor has to relocate to live with his grandmother (Sigourney Weaver), all while dealing with the increasing activity of the school bully. Then one night, as he’s sat in his bedroom, pens begin to roll off the desk, shoes seem have a life of their own as they slide across the floor, and through his window, the giant tree which has stood in the graveyard on the hill for hundreds of years, uproots and strides towards Conor, ripping the side of the house off and insisting that he tell him three stories, and when he’s finished, Conor must tell him a fourth. You see, Conor called the monster (Liam Neeson) and he’s here to help. We’ve seen Bayona handle familial tragedy on a large scale before with his tsunami drama, “The Impossible”, but here he returns to the same intimate destruction employed in his breakout film, “The Orphanage”. The themes in which he excels are similar, it’s almost Spielberg-like in the way that it permeates all of his narratives, and “A Monster Calls” is no different, with a parent’s love being the overriding plot thread. Exchanges between Conor and the monster are forthright and honest in a way that you might not expect from a kid’s movie. It’s not at all saccharine though; the emotions are handled with a sense of brutal realism. Whether that’s dealing with the role of his absent father (a terrific Toby Kebbell), or his no-nonsense grandmother (Sigourney Weaver), the relationships are grounded in reality. Even the exchanges between Conor and the monster, who’s a cross between a “Lord of the Rings” Ent and Optimus Prime, are forthright and honest in a way that you might not expect from a kid’s movie, and it’s admirable that this doesn’t shy away from the harshness of growing up. A comparable tome would be “Pan’s Labyrinth”, both thematically and visually. 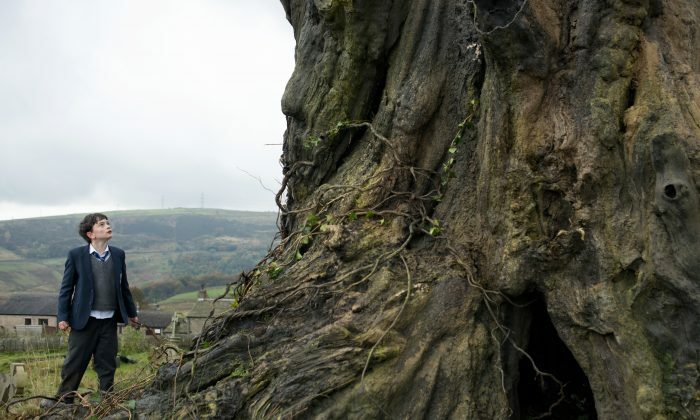 The real world is shot in a bleak, wind chill aesthetic, with an autumnal haze that runs concurrent with the idea of things reaching the end of their life cycle, but it’s during the more fantastical moments that “A Monster Calls” excels. The animated vignettes used to bring to life the monster’s stories are beautiful. So much more than your average coming-of-age movie, with tears gently coaxed from you, earned even, rather than any form of manipulative storytelling, “A Monster Calls”, while a tough watch, is also a must watch.